Lee Hyla, head of the NEC composition department from 1992 to 2007, died this week in Chicago, of pneumonia. He wrote for Kronos, the Orpheus Chamber Orchestra and many local ensembles and was performed far beyond. 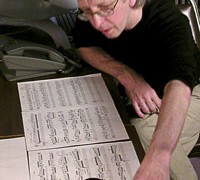 He latterly held the chair in music theory and composition at Northwestern University. Our condolences to Lee’s wife and family. Hyla was a superb composer and an artist of high integrity. He will be missed.